Ah… I love decorating for the holidays. The lights, the baubles and the bling all become my toys as I bring a little holiday cheer to our home. I try to keep it simple, subtle and a bit sassy. 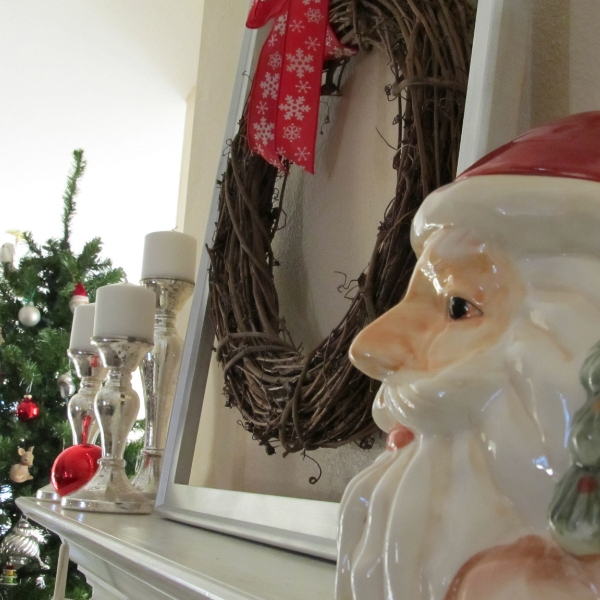 Let me show you a few of my tricks for simple budget friendly holiday decor. I can never have too many of these all-purpose fun and inexpensive ornaments. They can be hung on your tree, or used to fill bowls and vases. I always have an abundance on hand and find myself filling pretty bowls and baskets to the brim. They become centerpieces and able top accents. Since they come in a wide variety of sizes and colors your options are endless. I use the small ones as vase filler, and the larger ones in a bowls. Ok, so maybe I really like pretty things filling baskets and bowls. Another trick that actually carries me from October thru Christmas is to fill baskets with pine cones. You can collect them on a hike or buy a bag or two at the local craft store. I love the cinnamon scented ones, they fill the air with the sweetest smell. Who needs candles when you have scented pine cones? Our house has wreaths hung almost everywhere. I use a mix of the traditional pine garland wreaths and the more affordable DIY ribbon wreaths. Last year, I spotted a fun project that entailed yarn and a wire wreath form. I took that same concept and swapped the yarn for ribbon. Simply, pick up a wreath form and some pretty ribbon from your local crafts shop, and then wrap the ribbon around the form, tying it in a bow to finish it off. The use of lanterns seems so on trend right now, and well, I opted to jump on board. Now, you can go spend big $$$$ on lanterns from a few on line shops or hunt around the local Home Goods shop to find less expensive lanterns. I spotted a pair of red ones at Walmart for about $25 a piece. They were a tad pricey, but they will last a few years and can be used year round, so not bad over all. I filled them with simple LED candles I found at Target, with a timer. They sit nestled in with a pair of Poinsettias to decorate the front entry way. One of my absolute favorite tricks is to take picture frames and place either holiday cards, festive scrap book paper or beautiful wrapping paper inside. It’s an inexpensive way to brighten a wall, or table top with a touch of holiday bling. It’s also a good use of last year’s left over holiday cards. Hope you enjoyed my five simple tips to holiday decorating. How do you decorate for the holidays?